Joe Girardi was feeling pretty good about his team after Monday’s 9-1 blowout of the White Sox, but the manager seemed even happier about getting two of his rookies into their first big-league games during the one-sided affair. Cesar Cabral pitched a scoreless eighth inning, giving up a hit while recording the first two strikeouts of his career. In the bottom of the inning, J.R. Murphy pinch-hit for Robinson Cano – not a move I imagined we’re going to see very often – and registered an infield single to third base. “It’s nice to get some kids their first taste,” Girardi said. “You get a first strikeout and you get a first hit; that’s always nice.” Both players were called up when rosters expanded on September 1. Cabral, a Rule 5 pick from the Red Sox in December 2011, missed all of 2012 after suffering a left elbow fracture during spring training. 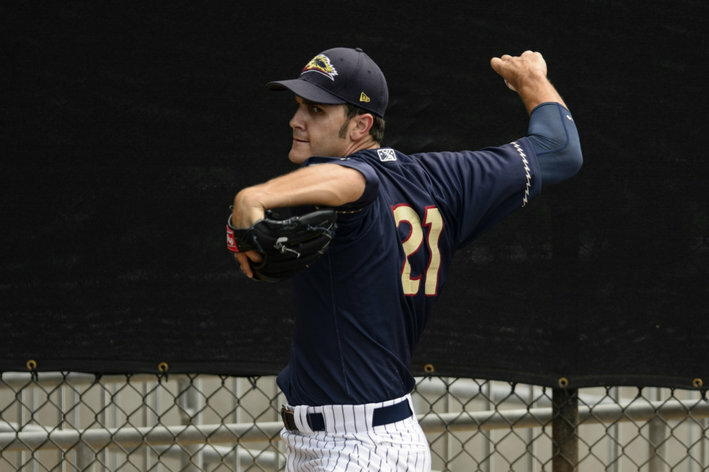 He had been in competition for a spot on the Yankees’ roster at the time of the injury, so his long road back – which included 25 outings at Double-A and Triple-A this season – made Monday’s debut quite memorable. “It feels really, really good right now,” Cabral said. “I did my rehab great. Thank God. I thought I might never come back, but I feel healthy and can help the team.” Murphy began the season at Double-A Trenton, hitting .268 with six homers and 25 RBI in 49 games before being promoted to Triple-A Scranton/Wilkes-Barre on June 13. He hit .270 with six homers and 21 RBI in 59 games there before getting the call-up over the weekend. September call ups are tomorrow, but there’s still news going around about a few players who may or may not be getting a promotion on the first of September. It seems that Melky Mesa will not be getting a call up this season as his hamstring injury has been deemed to severe for him to recover in time. He would have primarily been used as a pinch runner or pinch hitter, so it’s not a huge loss to the team, but it is a big loss for Mesa. The 26-year-old outfielder struck out 112 times (33.7 K%) with a sub-.300 OBP at Triple-A this season. In five games and 14 at-bats in the majors he hit .385/.429/.538, and it would be nice to see how close he can stay in that range. The Yankees are planning to call up Brett Marshall tomorrow, despite his lackluster performance this season. He has a 5.13 ERA and 4.62 FIP with a 4.41 walk rate in 138.2 innings in Scranton. He was called up for a spot start earlier in the season and gave up five runs on nine hits and five walks in 5.2 innings. He will likely provide extra depth for mop up innings and blowouts. JR Murphy will also be called up after being left out of tonight’s lineup. There will need to be a 40-man roster spot opened up before he is brought up, so Jayson Nix could be moved to the 60-day DL. He hit .268/.352/.421 in Double-A before he was promoted to Triple-A and hit .270/.342/.430. Murphy will only serve as the third-string catcher to add some depth behind the plate. He’d probably be a better option than Chris Stewart or Austin Romine, but it’s highly unlikely he’ll get much playing time, if any at all. David Adams will also be getting a call up to provide third base and second base depth. Preston Claiborne and Dellin Betances are also likely to get promotions to bolster the bullpen. Cabral has had control problems, but he has struck out 10.6 men per nine innings across 36 2/3 minor league innings this year. He’s the classic “second lefty” that Girardi likes to deploy, but whether or not the 24-year-old can actually be effective is anyone’s guess. Cabral will need a 40-man spot to be added to the roster, so Travis Hafner could join Nix on the 60-day DL.